What Does Subwoofer Phase Mean? Have you ever heard people say their speakers or subwoofers are in phase or out of phase? If so, do you really know what that means? In phase must be correct and out of phase must be wrong… Right? Not necessarily. When there are two woofers in the same enclosure with both woofers facing the same direction and one is wired out of phase, the woofer wired out of phase will move the opposite way. Within the subwoofer box, this can cause damage at high power levels because the woofers are moving in different directions and the pressure inside the enclosure can allow the subwoofers to move too much and/or too little. Too much movement can cause the subwoofer to move outside of linearity and too little movement can prevent the coils from cooling off. Connecting wires from the positive (+) terminal of the speaker to the positive (+) terminal of the amplifier, and connecting the speaker negative (-) to the amplifier negative (-), is called “Wiring In Phase" and is the more common type of wiring. Why would you ever want to wire your speakers or subwoofers “Out of Phase?” Well, have you ever seen installations where one or more subwoofers are mounted inverted to the listener? This means the back of the subwoofer is mounted outward. It is necessary to wire the inverted woofer “Out of Phase” in order to make it reproduce the audio signal in sync with the non-inverted subs. In the Out-Of-Phase diagram above, the two subwoofers on the left and right are mounted inverted and would require wiring to be “Out of Phase” in order to perform correctly. To understand what is happening, remember that the audio signal is an analog AC (alternating current) signal. So when the positive signal goes to the speaker, it pushes the subwoofer forward. When the signal sent is negative, the subwoofer pulls backward. 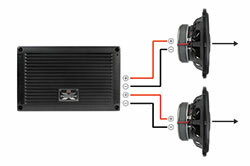 When two woofers are mounted in the same enclosure and one woofer is inverted, you would need to wire it “Out of Phase” in order to make the sub perform correctly. When the woofers are pointing in different directions, and one is out of phase, the cones will then move together and not cancel out. 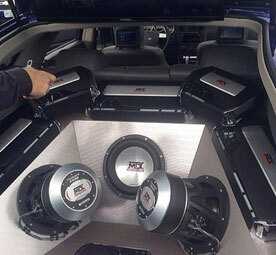 This arrangement works well if you would like to have the rear side of a subwoofer showing in your installation. This is how phasing of speakers is done intentionally. But what if you accidentally wire your speakers or subwoofers wrong? Or what if you speaker wires and/or terminals aren’t easily identified as positive or negative? How do you know if your speakers and subwoofers are wired correctly? The most common symptom of a speaker or subwoofer that is wired “Out of Phase” (when it shouldn’t be) is loss of bass. If you experience this, there are a couple ways to test the wiring phase. Listen to the audio – Turn the bass to the highest setting and turn the volume to a moderate level, adjust the balance and fade to one particular speaker. Listen to the bass, then change the balance to the opposite speaker. If your speakers are out of phase, you will notice more bass response from one speaker than the other. Test your speakers - If you have access to the speakers, connect a 12v or 14.4v drill battery, flash light battery, etc… to the speaker terminals, the speaker cone will jump forward (away from the magnet) or backward (toward the magnet) on the speaker. When the speaker cone jumps forward (away from the magnet), recognize which terminal is attached to the (+) positive side of the battery, this is the (+) positive terminal of the speaker. If you wire your speakers or subwoofers and there seems to be a substantial lack of bass, be sure to check your wiring. It could be as simple as switching the wires. Wiring “Out of Phase” does NOT cause any damage to full range speakers or the amplifier, but subwoofers can be damaged if not wired properly and the problem is not identified soon after installation. Wiring subwoofers “Out of Phase” in the wrong application can cause the signal to pull against each wind of the voice coil which will heat up instantly and burn or short out causing the woofer to fail. If the coils are wired out of phase on a dual voice coil subwoofer, damage can occur when signal from a amp is applied. The subwoofer will have no output, and will not be moving. This occurs because the subwoofer has no output in that each voice coil is pushing against the other coil. This condition won’t allow the subwoofer to move or make any sound. At the same time a tremendous amount of heat will be generated because the coil is not moving to cause air to rush by it. If a large amount of power is applied to the subwoofer in this case it will “cook” the coil which can cause premature failure. It’s like trying to ride a bike up a hill by pushing down on both petals at the same time. You won’t get anywhere except hot and sweaty. When the coils are wired in phase they both work together to move the subwoofer up and down according to the signal from the amplifier creating the Bass that one would desire. If you need additional assistance with wiring your subwoofers correctly according to your specific installation, please call MTX Audio Technical Support at 1-800-CALL-MTX, email us at support@mtx.com, or you can get immediate assistance through our online chat service at MTX.com.